There was an organized genocide of the Bengali Hindu population by the Pakistani Army in present-day Bangladesh in 1971, when 3 million i.e. 30 lakh people were killed, 20 lakhs of them Hindus & also other Muslims when the Pakistani religious leaders declared the Bangladeshis to be un-Islamic, and more than 2,50,000 Hindu women were raped. This forced many to migrate to India and live as refugees, most of whom were Bengali Hindus. After 1971, however, there has been a huge influx of Bangladeshi Muslims into Assam. This resulted in huge protests, which often turned violent, that culminated with the signing of the Assam Accord between the Government of India and the leaders of the movement in 1985. The Muslim population in Assam grew from 12.4% in 1901 to 24.68% in 1951. From 24.56% in 1971 it grew to 30.9% in 2001 and to 34.22% in 2011, a huge increase. This is impossible without immigration from Bangladesh. The following statistics on growth of Muslim percentage in Assam are taken from Scroll.in itself, a Leftist website. A major reason for the high infiltration of Bangladeshis was due to the IMDT Act, 1983 present in Assam which was done by the Congress. 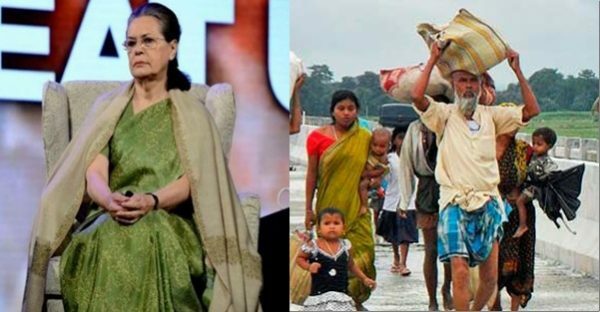 Former Congress President Sonia Gandhi during her campaign in the state in 2006, had allegedly promised to amend the Foreigners Act which would prevent the deportation of illegal Bangladeshi immigrants. OpIndia.com reports: “As per a WikiLeaks cable from 2006 allegedly sent by US consulate officer in Kolkata on 16th February 2006, on 11th February 2006, UPA chairman and Congress President Sonia Gandhi had travelled to Assam to launch the 2006 state assembly campaign. The cable says that while the BJP and Asom Gana Parishad (AGP) the main opposition in Assam were fragmented, Congress still had not lost support from the critical Muslim community. Sonia Gandhi had then offered to amend the Foreigners Act to prevent the deportation of illegal Bangladeshi immigrants. The Muslim vote is likely to determine whether Congress can retain its majority. The Muslim community’s importance has been magnified by a steady influx of Bangladeshi immigrants and Muslims presently hold 13 Congress seats in the assembly. Traditionally, Congress had been the party of choice for the Muslims as it protected illegal Bangladeshi migrants from deportation. Congress also supported the Illegal Migrants Determination by Tribunals Act (IMDT) of 1983, applicable only in Assam, which made identification, detection and deportation of foreigners in Assam incredibly complex and protected post-1971 illegal Bangladeshi migrants. Congress’ relations with the Muslims suffered a setback in July 2005, when the Supreme Court ruled the IMDT unconstitutional. “The Supreme Court on Tuesday struck down the Illegal Migrants (determination by tribunals) Act, 1983. The move is seen to be detrimental to the interests of millions of Bangladeshis in the country. The northeastern states, suffering for decades from a steady influx of Bangladeshis, have been demanding that the Act be scrapped and the illegal immigrants be deported under the Foreigners’ Act 1946.The Illegal Immigrants Act is seen to be against the interest of northeastern states, especially Assam. The Act provides that anybody who settled in Assam before 25 March 1971 is a legal citizen of India whereas the cut-off date for the rest of India is 19 July 1948. The apex court directed that all tribunals functioning under the IMDT, which has been declared unconstitutional, would seize functioning with immediate effect. Far from obeying the orders of the SC, and deporting the Bangladeshis or even trying to deport them, the UPA headed by Sonia Gandhi did the opposite, and amended the Foreigners Act 1946 to save Bangladeshis! On Friday, 10 February, 2006, The Ministry of Home Affairs published two notifications amending the Foreigners Tribunal Order of the Foreigners Act 1946, thereby proving once again as was stated by D.N. Bezbaruah, the then editor of the Sentinel that to the Congress party, remaining in power was more important than the security and integrity of the country. This prompted Mr Pramod Mahajan, the then BJP General Secretary to say: “Sonia Gandhi says the Foreigners Act was amended to protect genuine Muslims. What else can you expect from a person of foreign origin?” This was one of his last public statements before he was shot at on 22 April 2006 and passed away on 3 May 2006. But Sonia Gandhi’s act was overruled by the Supreme Court again on 5 December 2006. The SC held as illegal and unconstitutional the amendment to that Act and said that the whole country must have a uniform law on deportation. “The central government suffered a major setback on Tuesday [5 Dec 2006] with the Supreme Court holding as illegal and unconstitutional the controversial Foreigners (Tribunals for Assam) Order, 2006 that puts the onus of proving a particular person a foreigner on the complainant. A bench of Justices S.P. Sinha and P.K. Balasubramanian came down heavily on New Delhi for bringing the amendment after the apex court had declared the Illegal Migrants Determination by Tribunal Act (IMDT) as unconstitutional. The bench imposed an exemplary cost of Rs.25,000 to be paid to the petitioners, Sarbananda Sonowal and Charan Chandra Deka, who challenged the controversial Feb 2006 order. While striking down the IMDT Act, the apex court had given necessary directions for the constitution of adequate tribunals to determine illegal migrants, the bench said. In spite of that, the central government had failed to set up the tribunal and instead had amended the Foreigner’s Act, the judges said. The court directed the central government to set up tribunals within four months for determination of illegal migrants and for their deportation. Thus there is no need to cite Wikileaks to know what the UPA did. They will continue this until the Hindus become a minority everywhere. 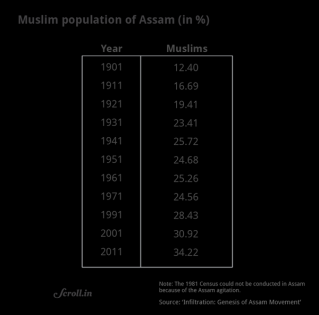 In Assam the Muslim % of population has grown from 12.4% in 1901 to 34.22% in 2011, a huge increase in a mere 110 years. It is inevitable that after few years, Hindus will become a minority in Assam if the influx from Bangladesh and high growth rate in Muslims continues, and then meet the same fate as they did in Pakistan, becoming less than 2% of the population. Of course, for our liberals, even this will be a good thing, since they consider Hindu religion as evil, and the Hindus as ‘cruel, medieval’ people. But the Hindu intellectuals need to expose this, and defeat our Leftist propagandists, who are concerned about India becoming a ‘Hindu Pakistan’ whereas there is a far more serious danger of India becoming an ‘Islamic Pakistan’. This article by the unknown author was first published in Satyavijayi. Featured image courtesy: Defence News and Deccan Chronicle.